Opal is a hydrated amorphous form of silica; its water content may range from 3 to 21% by weight, but is usually between 6 and 10%. Because of its amorphous character, it is classed as a mineraloid, unlike the other crystalline forms of silica, which are classed as minerals. It is deposited at a relatively low temperature and may occur in the fissures of almost any kind of rock, being most commonly found with limonite, sandstone, rhyolite, marl, and basalt. Opal is the national gemstone of Australia. Australian opal has often been cited as accounting for 95-97% of the world’s supply of precious opal, with the state of South Australia accounting for 80% of the world’s supply. Recent data suggests that the world supply of precious opal may have changed. In 2012, Ethiopian opal production was estimated to be 14,000 kg (31,000 lb) by the United States Geological Survey. USGS data from the same period (2012), reveals that Australian opal production to be $41 million. Because of the units of measurement, it is not possible to directly compare Australian and Ethiopian opal production, but these data and others suggest that the traditional percentages given for Australian opal production may be overstated. Yet, the validity of data in the USGS report appears to conflict with that of Laurs and others and Mesfin, who estimated the 2012 Ethiopian opal output (from Wegal Tena) to be only 750 kg (1,650 lb). The internal structure of precious opal makes it diffract light; depending on the conditions in which it formed, it can take on many colors. Precious opal ranges from clear through white, gray, red, orange, yellow, green, blue, magenta, rose, pink, slate, olive, brown, and black. Of these hues, the reds against black are the most rare, whereas white and greens are the most common. It varies in optical density from opaque to semitransparent. Recommended For You What are the minerals and Gems that found in the Sedimentary rocks? Common opal, called “potch” by miners, does not show the display of color exhibited in precious opal. Black opal is characterised by a dark body tone causing brightness of colour which is unmatched by lighter opals. Black Opals are usually mined in Lightning Ridge, New South Wales, and are the most famous, and sought-after type of opal. The term ‘black opal’ does not mean that the stone is completely black (a common mistake), it simply means the stone has a dark body tone in comparison to a white opal. Australian black opals are the most valuable and widely known type of opal. Black opal is characterised by a dark body tone which can range from dark grey to jet black. (See the following chart). However this refers only to the general body tone of the stone, and is not related to the rainbow or spectral colours present in the opal. 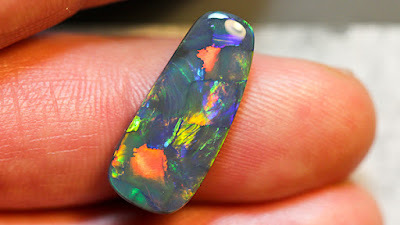 Some people expect a black opal to be completely black (in which case it would be completely worthless). Also known as ‘milky opal’, white opal features light white body tones, and is mined in South Australia. 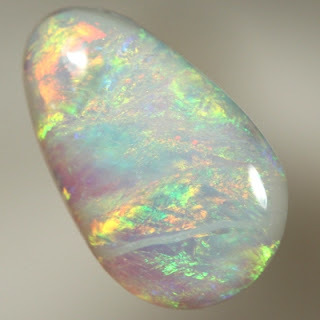 White opal is more common and because of its body tone, generally does not show the colour as well as black opal. 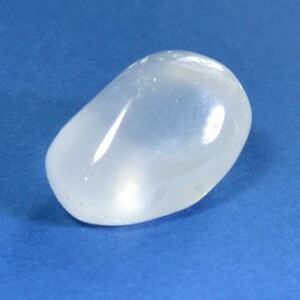 Nevertheless, white opals can still be absolutely magnificent in colour if a good quality stone is found. Boulder opal forms on ironstone boulders in Queensland. 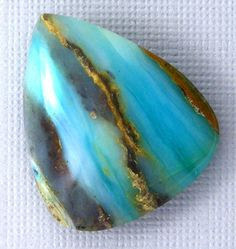 This type of opal is often cut with the ironstone left on the back, as the opal seam is usually quite thin. Leaving the ironstone on the back means that boulder opal can be very dark and beautiful in colour. The opal forms within the cavities of the boulders in both vertical and horizontal cracks. Boulders vary in shape and size, from as small as a pea, to as big as a family car. Boulder Opal has a tendency to cleave; when cleaved the “split” leaves two faces of opal, with a naturally polished face. Crystal opal is any of the above kind of opal which has a transparent or semi-transparent body tone – i.e. you can see through the stone. Crystal opal can have a dark or light body tone, leading to the terms “black crystal opal” and “white crystal opal”. 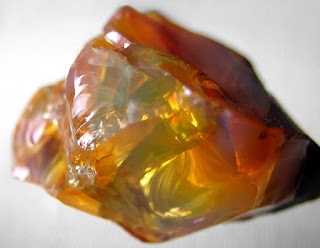 Is a transparent to translucent opal, with warm body colors of yellow to orange to red. Although it does not usually show any play of color, occasionally a stone will exhibit bright green flashes. The most famous source of fire opals is the state of Querétaro in Mexico; these opals are commonly called Mexican fire opals. Fire opals that do not show play of color are sometimes referred to as jelly opals. Mexican opals are sometimes cut in their ryholitic host material if it is hard enough to allow cutting and polishing. This type of Mexican opal is referred to as a Cantera opal. 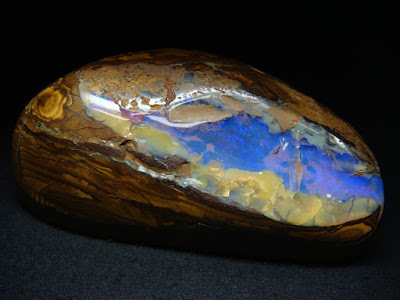 Also, a type of opal from Mexico, referred to as Mexican water opal, is a colorless opal which exhibits either a bluish or golden internal sheen. Is a term sometimes mistakenly and improperly used to refer to fire opals, as well as a type of transparent to semitransparent type milky quartz from Madagascar which displays an asterism, or star effect, when cut properly. However, the true girasol opal is a type of hyalite opal that exhibits a bluish glow or sheen that follows the light source around. It is not a play of color as seen in precious opal, but rather an effect from microscopic inclusions. 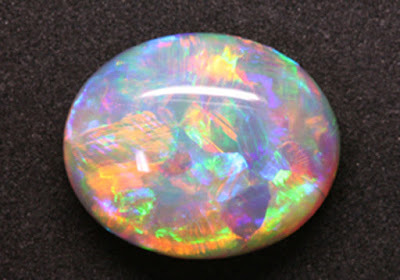 It is also sometimes referred to as water opal, too, when it is from Mexico. The two most notable locations of this type of opal are Oregon and Mexico. Is a semiopaque to opaque blue-green stone found in Peru, which is often cut to include the matrix in the more opaque stones. It does not display pleochroism. Blue opal also comes from Oregon in the Owhyee region, as well as from Nevada around Virgin Valley. More Info about Opal : What Is Opal?